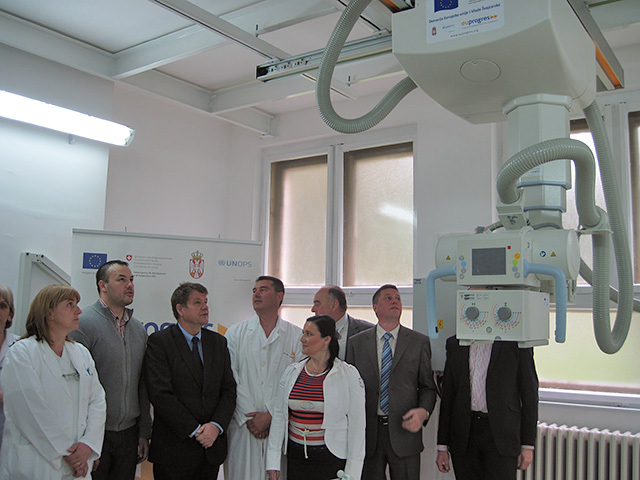 Ivanjica Health Centre received today a new X-ray device worth 66,070 Euros, which was procured with financial support from the European Union and the Government of Switzerland through the European Partnership with Municipalities Programme - EU PROGRES. The healthcare institution in Ivanjica currently uses only one X-ray diagnostics device, which is only partially in use, so the patients often have to travel more than 70 kilometers to get their medical checks in the hospital in Čačak. New machine will contribute to the improvement of the health care in Ivanjica and better work conditions of the employees of the Health Centre, while the waiting list will be significantly reduced. “Our hospital used to have three X-ray diagnostic machines, but all of the devices are beyond their lifetime. The inhabitants of Ivanjica now will no longer have to go to Čačak to get their medical examinations,“ Mayor of Ivanjica Milomir Zorić said. “With the Municipality of Ivanjica we have implemented a laerge number of important projects so far. The procurement of this diagnostic equipment is a project which will benefit the citizens immediately. Despite from the fact that EU PROGRES has ended, the support to the municipalities, among which is Ivanjica, will be continued through the successor development programme,” EU PROGRES Manager Graeme Tyndall said.